Trainer Kenny McPeek is no stranger to success. The conditioner’s impressive resume includes having conditioned seven millionaires. Harvey Wallbanger appears well on his way to reaching that milestone, after running down Epic Dreamer and Maximus Mischief and drawing clear from Everfast, to win the 29th edition of the $350,000 Holy Bull Stakes (G2) Saturday afternoon at Gulfstream Park. Two Kentucky Derby winners have come out of the race — Go for Gin in 1994 and Barbaro in 2006. The bay colt is owned by the partnership of Herold Lerner, LLC, AWC Stables, Nehoc Stables, Scott Akman and Paul Braverman. McPeek is also no stranger to saddling longshots to win Grade 1 races, as evidenced by Sarava capturing the 2002 Belmont Stakes — at 70-1 — after War Emblem claimed the first two legs of the Triple Crown. And while most of the attention was being paid to Remsen hero Maximus Mischief on Saturday, the betting public shied away from the son of Congrats, who went off as the sixth choice in the field of the nine, at odds of 29-1. However, Harvey Wallbanger didn’t read the clippings from the various publications dismissing the notion that he couldn’t compete with the other eight entries who contested the 1 1/16-mile race. Jockey Brian Hernandez’s trip was masterful. He was patient while saving ground, knowing what he had underneath him. That trust would pay dividends, as Harvey Wallbanger finished a length in front of Everfast and, in doing so, earned 10 points toward a place in the 2019 Kentucky Derby. Harvey Wallbanger secured $208,320 for his victory. 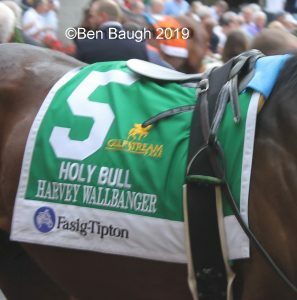 Harvey Wallbanger benefitted from spending time at McPeek’s Magadalena Farm in Lexington, Kentucky, and the foundation put underneath the colt during that time undoubtedly factored into the Holy Bull result and validated the thought process of his connections.